An electric knife is a great addition to your kitchen cutlery set, especially if you slice and dice a lot when you cook. In a way, electric knives will make cooking a lot easier and faster. There are dozens of electric knives available on the market today — you might have a hard time finding the best one. Therefore, you need to consider a few factors, like corded or cordless, control features, blade versatility, and others. To avoid the confusion, we will help you narrow your list down to the best models available today. Are you in a hurry? With more than 1.000 satisfied customers reviews and even more sales, this fantastic electric knife from Cuisinart is used in many homes and restaurants around the world, as it can cut or slice a wide variety of food efficiently. The Cuisinart CEK-40 has two stainless steel detachable blades: the bread and carving blades. Its handle sports fantastic features to optimize control upon use, thus helping you make clean cuts without any hassles. If you’re tired of manually cutting roasted meat, bread, fruits, vegetables, and some other food ingredients, then you should check out this model. Since it’s an electric utensil, you should avoid using it on a wet area. The wood butcher block takes a considerable space, which is not ideal if you have a small countertop. The Cuisinart CEK-50, is a cordless electric knife with dual functions. It features two detachable blades and has an electric motor that runs on two lithium batteries. Its two detachable blades — the serrated and the straight-edge — have different but superior purposes. The serrated blade can easily cut through tough meats and pastries, whilst the straight-edge blade cuts softer fruits and vegetables. Since it’s battery-powered, you can use it anywhere, especially in places without power outlets. It can run for 20 minutes on a full charge and takes only 30 minutes to recharge. In addition, the Cuisinart CEK-50 comes with a compact storage case, which will let you keep and carry it around without any problem. The lifespan of its batteries could be insufficient for long periods of outdoor cooking. The motor tends to overheat when cutting tough food. This knife is quite heavier than other electric knives. Cuisinart CEK-50’s ergonomically-designed handle is the cornerstone of its efficiency. Moreover, it also has innovative safety features to keep your hands safe while cooking. On top of that, if you’re the outdoorsy type, this knife should be on your toolbox. Cordless electric knives are unbeatable in terms of portability, which makes the Cuisinart CEK-50 Cordless is a great addition to your outdoor cooking tools. With this in your pocket, you’ll never settle again on bringing easy-to-cut food items to your hike. The Cuisinart CEK-40 is a well-crafted electric knife that can cut or slice a wide range of ingredients. It can cleanly cut meat, vegetables, fruits, bread, and some other stuff without much effort, making it a fantastic choice for a knife in the kitchen. It features a quality handle you can efficiently hold in either hand, giving you a good grip upon use. Its safety lock keeps the blade in place, lessening the risk of cutting yourself while handling it. 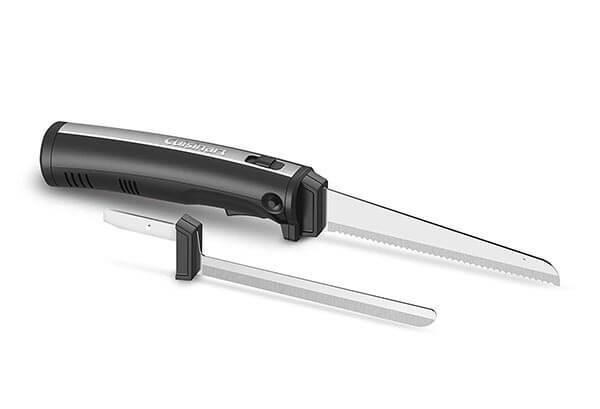 The Cuisinart CEK-40 also comes with two detachable stainless steel blades, which are the carving and bread blades. You can use the bread blade for slicing bread, while the carving blade for various meats, fruits, vegetables, and other food ingredients. After using it, you just have to keep this electric knife in its wood butcher block storage, which you can place on your countertop. If you need a reliable electric knife for your kitchen, then the Cuisinart CEK-40 is definitely a good choice. While it still has some drawbacks, they don’t outweigh the perks that you will enjoy from using it. The Cuisinart CEK-40 can even help you prepare a full-course dinner without needing other knives, making it a convenient option for homes and restaurants. 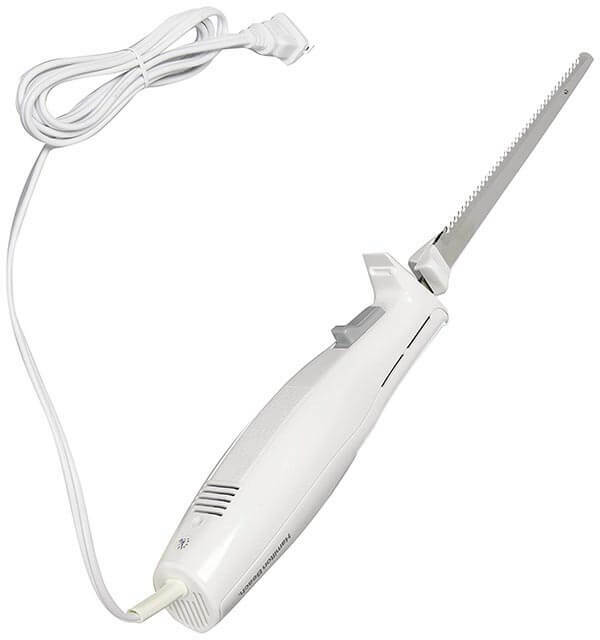 Another thrilling electric knife you can buy is the Hamilton Beach 74250. Never worry again about imperfect cuts of meat, bread, or cheese. With its mechanism, you can cut perfectly shaped slices of meat, bread, cheese, and other food ingredients with ease. It sports a 100-watt electric motor that oscillates its sharp stainless steel blades, thus making it easy for you to cut various types of food. Both left and right-handed users can also get to enjoy its efficiency. The Hamilton Beach 74250 also comes with a stainless steel fork to hold down the piece, making slicing even easier. Both the blades and the fork are easy to clean and everything can be placed in a safety case with ease. This knife has a large handle, so it can be uncomfortable to use if you have smaller hands. Its motor easily warms up, making the handle hot to touch as well. Despite its cons, the Hamilton Beach 74250 is still a great choice if you want to buy an electric knife. Its stainless steel sharp blades allow you to carve and slice with ease, and its fork makes things even easier for you. In addition, its portability is something you can’t appreciate, especially when you are preparing food outdoors where power outlets are not accessible. Of course, it’s tagged with an affordable price as well, which is already a great deal considering its powerful features. 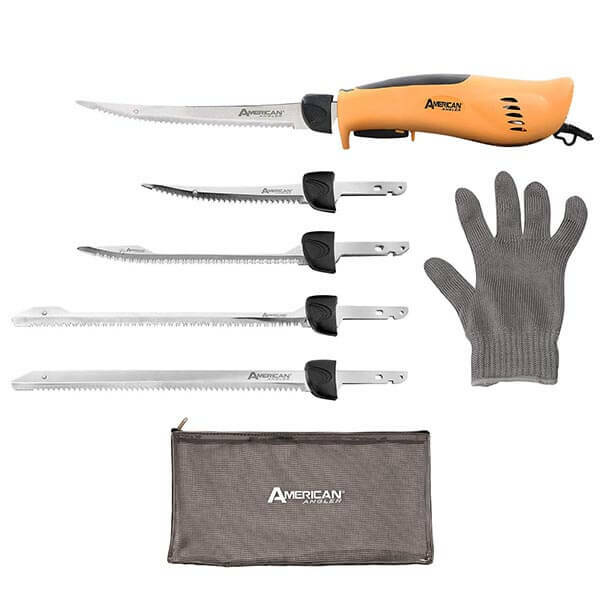 Made by fishermen for fishermen, the American Angler PRO is designed to make precise cuts and slices on large, scaly fishes you just caught. Its blades will let you cut any type of fish the bones, with its 110-volt electric motor giving you enough power for a smoother and faster process. Also, this electric knife comes with five different blades, letting you choose the best one for a certain fish. You can start with a simple saltwater blade or opt for the heavy-duty shark blade, depending on what you need. To top it all off, you can carry this knife in a convenient carrying bag. It’s well-ventilated, so the fishy odor won’t stick to it. The handle can get really hot when preparing fish that are tough to cut, which would not be good if you have plenty of fish to prepare. The spring that pushes the power button back out is not strong enough, which means that this knife would not be a good option when cleaning very large fish, where things can get messy and sticky. Power button could also get stuck. All in all, the American Angler PRO is a great electric knife to buy, especially if you’re pescatarian and cook your own fish. Its five replacement blades are extremely handy, letting you deal with a wide range of fish species. Furthermore, its power is adequate to prepare them in no time. While it has its own set of drawbacks, it’s still one of the best electric knives that you can have today. 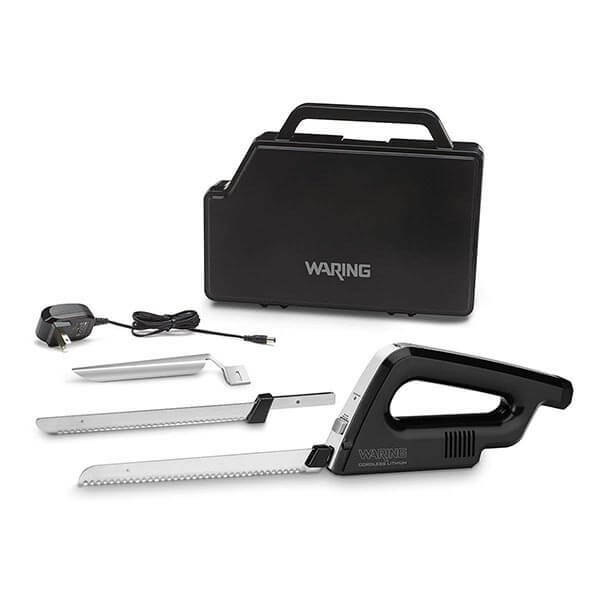 The Waring Commercial WEK200 is a portable electric knife that comes with two blades, the carving, and the bread blades. You can also rely on its ergonomic handle design for efficient grip and on its power switch for preventing accidental activation. Moreover, it has a powerful electric motor running on a rechargeable lithium battery that lets you do efficient and smooth slices. What’s unique about the Waring Commercial WEK200 is the LED light that makes it easy for you to work on dimly lit environments. And, catch this: it comes with a slicing guide to precise cuts. A hard case is also included in the package for easy storage. 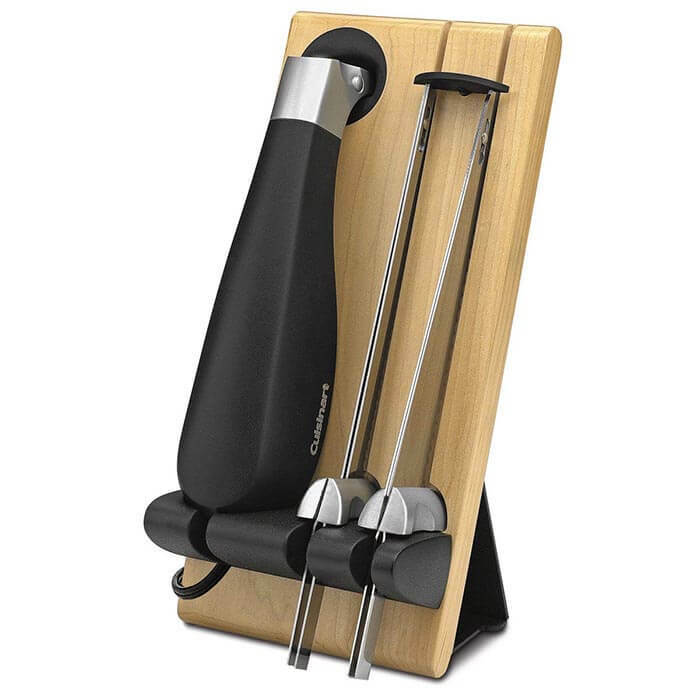 It’s equipped with a nice handle so you can carry the knife set anywhere comfortably. Two sharp stainless steel blades that let you cut various food and ingredients. Stainless steel blades that are easy to clean and are resistant to corrosion. As it has a built-in battery, you might need to recharge it before you can even finish preparing your food. It only has serrated blades, which means that it cannot be used for all types of food. Got a bakery or pastry shop? Or do you just enjoy eating loaves of bread? You should invest in the Waring Commercial WEK200. The Waring Commercial WEK200 is a fantastic electric knife to buy, especially with its great features that you can’t find in other electric knives. Besides loaves of bread and pastries, you can cut other food pieces with this knife. Moreover, its portability is a big plus. Like other cordless electric knives, you can use it even when you’re away from any electric source.